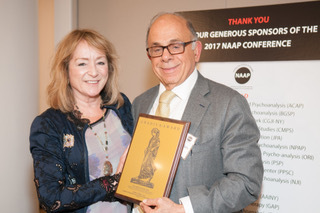 Dr. Gargiulo receiving the Gravida Award for his book, Quantum Psychoanalysis, at the 2017 NAAP Conference. Gerald J. Gargiulo dares to go where no other psychoanalyst has gone before. In this collection of essays, he introduces a new world, namely, the interface between quantum physics and the unconscious. Offering a highly nuanced view of psychic reality that has implication for clinical theory, his insights are as perspicacious as they are original. His clear and basic presentation of quantum physics models engage both theory and technique. This text, with it other essays on psychoanalytic topics, should be of interest to anyone practicing in the twenty first century. In these essays Dr Jerry Gargiulo considers psychoanalysis with a rarely encountered depth and breadth. Grounded in his life-long studies of religion and philosophy, including the philosophy of science, this volume offers an opportunity to grasp the fundamentals of psychoanalytic theory and treatment, from a bird’s eye view, through models of understanding as apparently diverse as psychoanalysis and quantum physics. Presented here is the evolving perspective of a contemporary renaissance man that illuminates the trajectory of his quest for a broadly comprehensive psychoanalytic appreciation of human beings. The humane and poetic reflections of a seasoned psychoanalyst – and a person interest in the vicissitudes of human life – Jerry Gargiulo’s Quantum Psychoanalysis will stimulate and delight; and, like psychoanalysis at its best, enrich the way you see yourself and relate to the world.